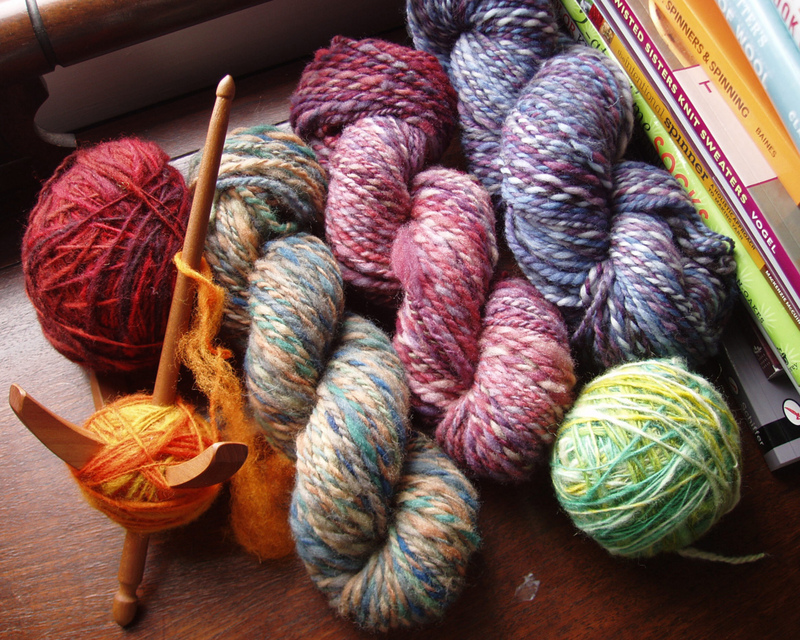 I’ve been knitting and spinning for about 6 years. The first craft show I did was in 2006, but it wasn’t until recently that I really started focusing more on this as a business venture. In 2008 I opened an Etsy shop, and this past year I have tripled the number of shows I attend. 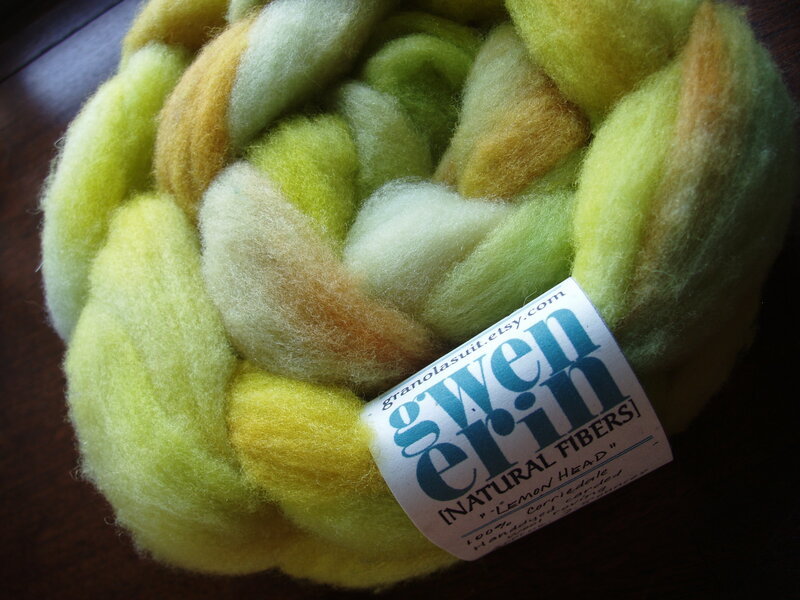 It’s difficult to say what got me interested in fiber arts. When I think back, I can remember carding my cats’ fur when I was about 6 or 7 years old, although I’m not sure how that idea came into my head. Also, I crocheted for a brief period when I was 12. At that point my favorite aspect of crocheting was winding the yarn into balls. I think I would just wind a ball of yarn into a ball of yarn and didn’t really get much crocheting done. It wasn’t until I went to college and saw a whole table full of knit hats at a craft show that I really became interested in learning how to knit. After that I took a spinning class during a medieval reenactment event. From there everything else just seemed like a logical next step: dyeing, weaving, carding, combing, felting, and eventually selling. 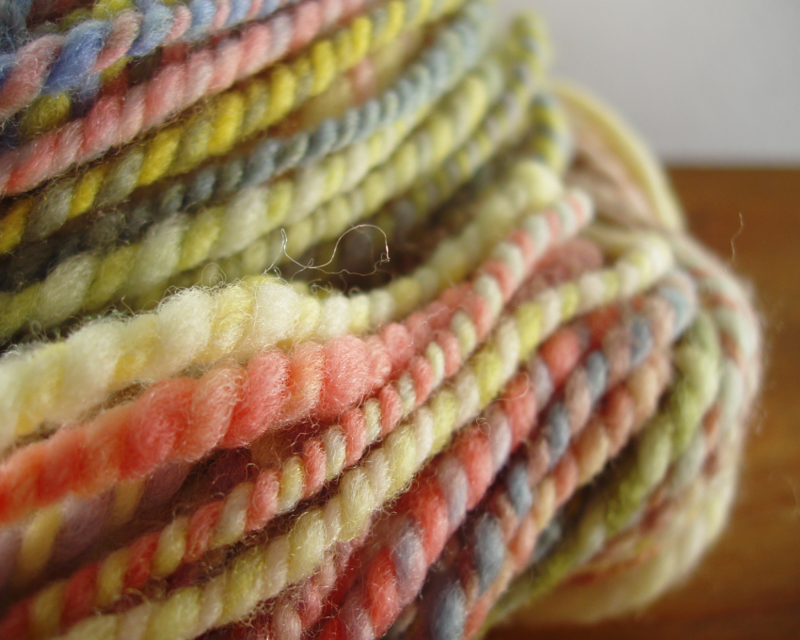 My favorite thing about fiber arts is just the variety of it. There are so many different ways to use fiber and so many great tools to collect. If you have a short attention span, like I do, this is a great way to keep yourself interested. Sometimes I get really excited about weaving and just focus only on that, but the next day I might get out my drumcarder and work with it for a few hours. It’s hard to get bored because there are so many options. It is difficult to say what inspires me. As far as colors, I often see things in nature that I want to recreate when dyeing. If I’m planning a new pair of mittens, I might try to incorporate an interesting striping pattern from a favorite sweater. If I was able to find a true source of inspiration, it might make my work easier or at least more inspired! My creations are unique because I have no particular scientific method when I work and that means each item will be different from every other item. This can be a challenge, however, if I find that I’ve dyed something I really love. I have to think back as to how it came into being and I can’t always remember. 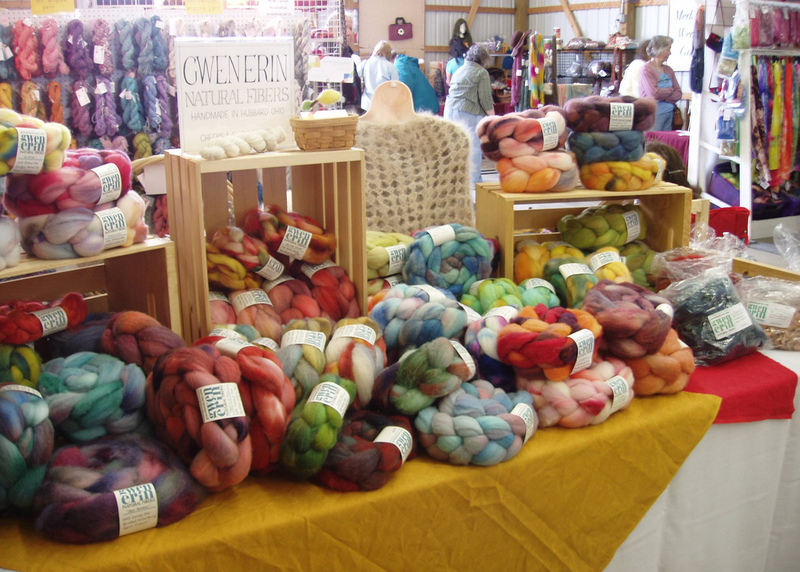 Also, I like to work with wool from farms that are local to me – northeastern Ohio and western Pennsylvania. It’s a great way to support local farmers and find out what breeds of sheep are excelling in this particular climate (Romney appears to be doing well). Rather than a specific item, I would say I really like my ever-changing collection of bulky yarns. They are quick, easy, and fun to create and work with. Plus they are so squishy and lofty. As far as colorways, I do not have repeatable recipes; however there are color combinations that I tend to gravitate towards. I love the way purple, orange, and red/pink interact. I like working with the “pie pieces” on the color wheel; those colors that are next to each other rather than opposite. 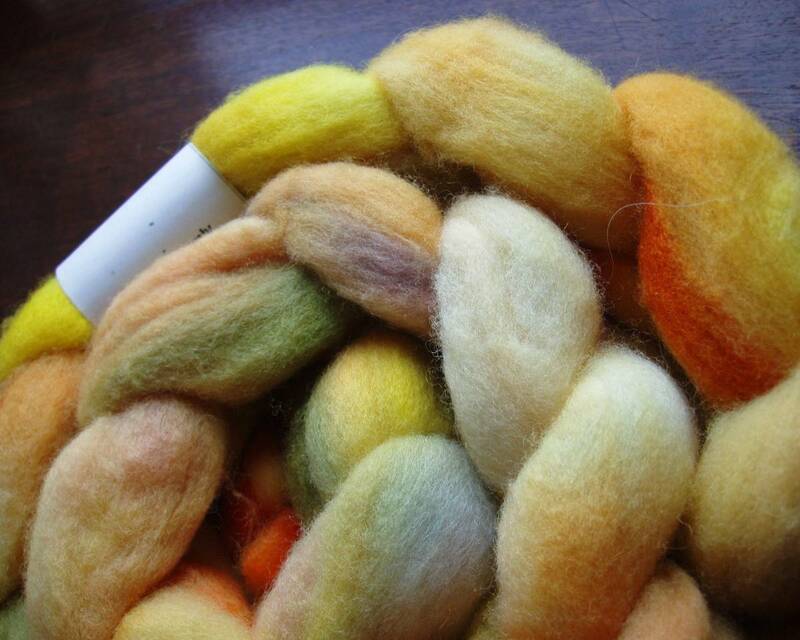 I strive to offer the fiber arts community fun, lively colors in many different and varied types of wool. 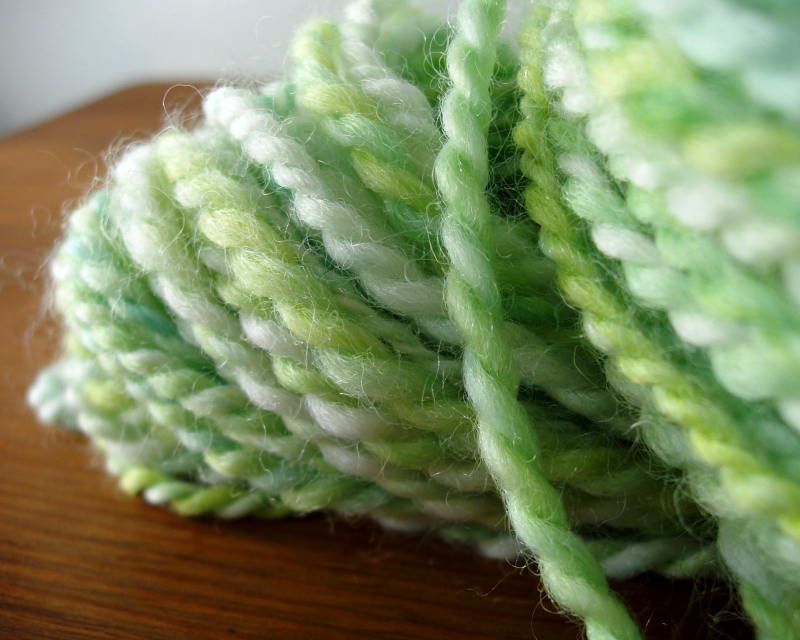 This can be as yarn, prepared spinning fiber, or locks. No matter your skill level, there is something to suit your needs, and it will always be a little different than what you bought before. I love variety, and each fleece I buy is different, even if it comes from the same animal year after year. I want my fiber to have personality. I want my customers to embrace the variation of nature instead of buying the same blank, over-processed fiber again and again. Certainly, it’s hard to keep the fiber contained, physically and otherwise. I’m a lot more thoughtful when I buy clothes, looking at the fiber content; I plan my vacations around fiber festivals; I take my knitting with me wherever I go. Now that I’m increasing the number of shows I attend, I must also increase production, so a lot of my free time at home is spent working on various fiber projects. The way it has affected my life the most is by consuming it entirely. I am a great ball winder. When I first started knitting, I decided to buy a hand crank ball winder on Ebay. It was the first time I bought anything there and it came from Canada. Let’s just say the French stamps were significantly more thrilling than the ball winder. Instead of buying another one, my husband bought me a nostepinne for Christmas and now I use it exclusively. Considering that I spent most of my time winding yarn balls instead of crocheting as a kid, I think I may have found my reason for living. Five years ago I wasn’t too active in the fiber arts world; in fact, I was just really getting started. I was still creating and experimenting at home alone, staying on the periphery of the community. These days I’m out doing demos when I can, signing up for more fiber shows, and generally trying to go for it. Five years ago I never would have thought I’d be so involved in the business aspects. It took me many baby steps and a great deal of pondering before I even ventured into opening an online shop. Hopefully I’ll be even farther along in another five years.